Wi-Fi is the popular wireless networking technology that uses radio waves, to provide us with wireless high-speed Internet connections. Wireless devices like cell phones, tablets, and laptops use electromagnetic waves to communicate with wireless routers, which are manufactured in compliance with strict safety standards. This article examines their safety, and explains how to protect yourself. The International Agency for Research on Cancer has classified Wi-Fi radiofrequency (RF) energy as "possiblycarcinogenic to humans". The UK Health Protection Agency conducted a study which showed that Wi-Fi routers endanger the health and development, of both people and plants. Children have rapid cellular replication and growth rates, which make them especially vulnerable to DNA damage. They also have a longer lifetime exposure to this new pervasive radiation than any previous generation. 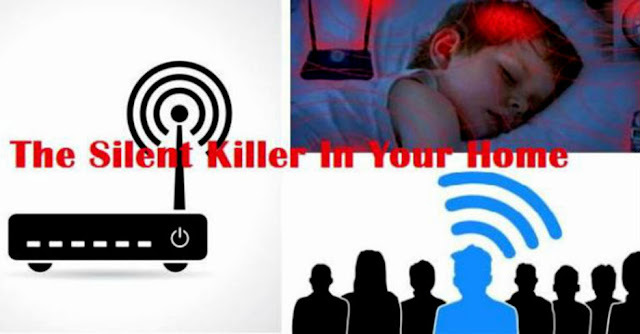 Wi-Fi Radiation – Health Risks. Wi-Fi Radiation – How To Protect Yourself. .Do not place the wireless router in your kitchen, or bedroom. .Avoid keeping your cell phone in your pocket, or on your belt. .Use caution using your cell phone in your car. Signals bounce around inside your vehicle, and your head is the antenna. .Use wired phones when at home, to reduce electromagnetic radiation. .If you're pregnant, keep your cell phone away from your belly. Keep your phone at the other end of the room, or on the seat of the car. Use texting more than talking. .Avoid using wireless baby monitors, as they all operate on microwave frequency. Look for the old wired monitors. .Disconnect all Wi-Fi devices before going to sleep.